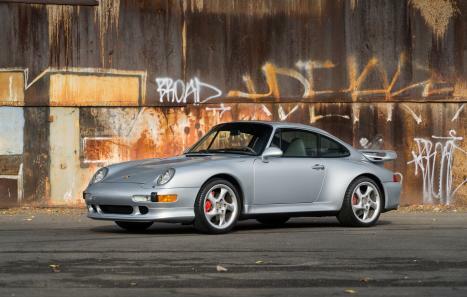 The Porsche 993 Carrera 4S is nearly identical to the 993 Turbo, cosmetically. They both received turbo wings and more aggressive styling. The core differentiators between the two models was that the C4S was equipped with a naturally aspirated, 3.6L, air-cooled, flat-six-cylinder engine which served as the base for the bi-turbocharged variant that the Turbos received. 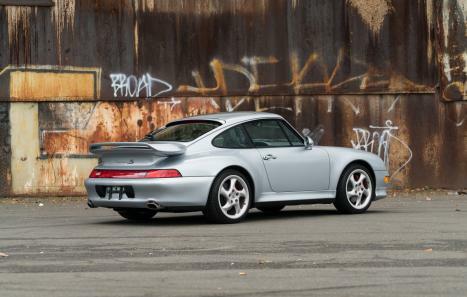 The C4S was also engineered with a four-wheel-drive chassis (hence the “4” in the model designation) while the 993 Turbos were all rear-wheel-drive. The C4 “S” variant also implemented a lower ride height and more robust suspension. These cars offer one of the last, most authentic, and refined air-cooled 911 driving experiences before Porsche entered the water-cooled era. On offer is a 1996 Porsche Carrera 4S coupe, chassis number WP0AA2996TS322892, original engine number 64T04702, having traveled approximately 61,000 miles from new. The Porsche Certificate of Authenticity confirms this example remains finished in its desirable, factory assigned color combination (Polar Silver Metallic “A8” exterior, Classic Grey interior). This is an extremely rare specification C4S that is thoroughly equipped with a series of exclusive options. One will immediately notice the front and rear factory Aerokit Turbo II spoilers giving the illusion that this C4S is a Turbo. Entering the cabin, one will find many more unique and desirable options. This example is also equipped with painted hard-back electric sport seats and carbon/aluminum shifter and brake handle. Other options include rear wiper, 4 rim caps with Porsche crest, HiFi sound system, AM/FM radio with cassette player, and 6-disc remote CD changer. The paint on this C4S would fall in the category of “very nice driver quality.” It remains in its original color and presents handsomely, lacking any significant blemishes. The faults that one would notice during a close inspection all fall in the realm of what one would expect with a 61k mile example. Localized on the front nose, bumper, and lower lip area are a series of stone chips, minor-light scratches, and mild marks of use but nothing of a severity that would warrant immediate refinishing. On the rear spoiler is about a 4” hairline crack in the paint due to flexing/vibrations during road use. The body of this C4S has a consistent finish from panel to panel, also possessing a nice shine. Looking over the glass, rubber components, and exterior trim items, everything presents in tandem with an example with similar mileage or better in many respects. The painted wheels have incurred no severe curb rash with the worst blemish being a peanut size paint chip at the edge of the passenger front wheel. The tires have ample tread life left and no cracking or dry rot. The interior of this example shows beautifully- the painted hard back sports seats having faired very well over the years. There is no significant bolster wear, inconsistencies in the finish or damage to the original leather. The leather wrapped door panels, dash, rear bulkhead, and center console all present phenomenally and have no notable inconsistencies. 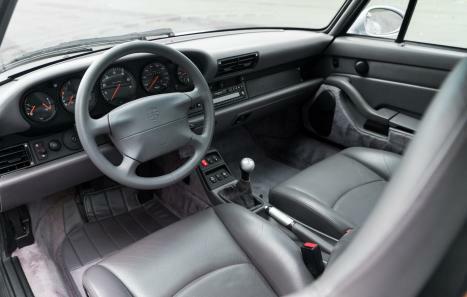 Glancing down at the grey rugs, they have clearly been well-kept and the rear seats, as with most air-cooled Porsches, look almost new as they have seen little to no use. The electric window switches, gauges, knobs, and related systems all functional without fault. In short, the cabin of this example is cosmetically superior, especially when considering the miles. The front boot is a gold mine of factory markings, original stickers, and factory stampings. There is simply nothing one could justifiably fault in regard to this area. Moving to the engine bay, from what is visible we can again see many factory stickers and markings on bolt heads. All related engine componentry appears like new and it is obvious this example saw very regular maintenance executed by capable technicians. Our specialists at LBI Limited are extremely astute in this era of air-cooled Porsches in all facets and based on a test drive as well as an extremely detailed visual inspection, we have concluded this C4S is mechanically excellent. Upon initial start-up, even after being in storage for a few weeks, the engine comes to life almost instantaneously and does not excessively smoke. 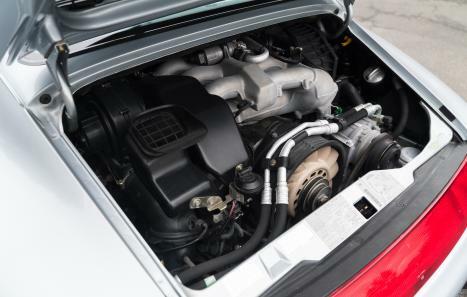 The engine does not appear to have any notable oil leaks, a common fault with these Porsches, and performs without missing a beat during spirited drives. The steering feels tight and lacks any excess play with the brakes quickly knocking off speed without pulling, squeaking, or fading. The 6-speed gearbox operates without fault and the linkage lacking any serious play in the bushings making gear-changes effortless. The clutch does not have any symptoms that indicate the need for replacement or adjustment. This example is ready to be driven and enjoyed on a casual drive around town or put through the gears on a Sunday morning on your favorite back-road. The 1996 Porsche C4S on offer is an extensively optioned, well-kept, factory correct, example that is ready to move onto its next custodian. Given that this example's well-kept driver quality cosmetic presentation, mechanical integrity, and the miles on the odometer, it makes it the perfect C4S to drive rather than induct into ownership as a sparingly used garage queen. The value in this C4S lies not only in its elite cosmetic/mechanical condition per the miles and rare factory configuration, but also in the reality that this is an example for the enthusiast that intends to consistently use his/her cars. Included in the sale is the window sticker, manuals, tool kit, Certificate of Authenticity and air-compressor. Please visit www.LBILimited.com for many more photos and details. Worldwide shipping is available upon request. Follow us on Instagram and Facebook at @LBILimited #claimyourclassic.